Standing at an open window I’m entranced for a moment by the warm rays of sun dappling through the time-worn room. 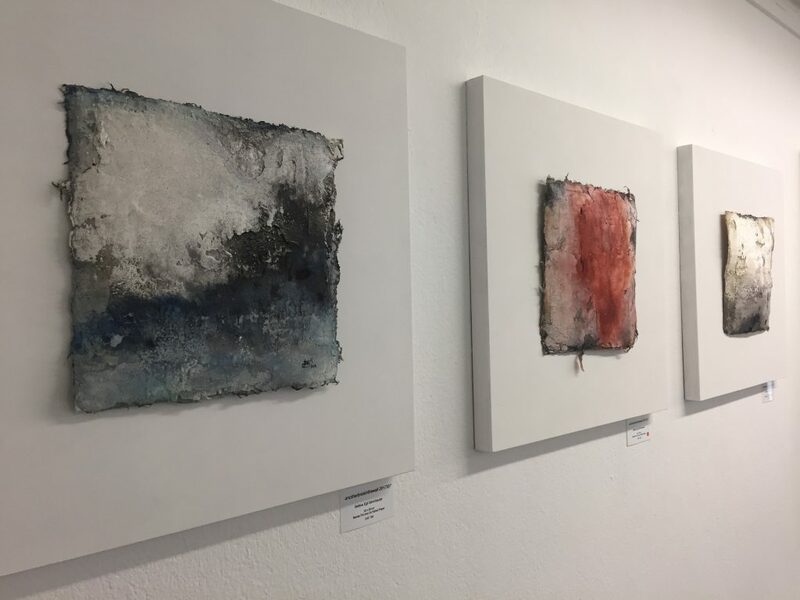 I’m surrounded by the white walls of a gallery space on Basel’s ancient Riehentorstrasse – now home to the first Pop-Up Gallery for the art agency Front of Bicycle – and I’m fortunate enough to be having a preview of the art going on display. Some time later, the opening night apero has drawn a large friendly crowd mingling and musing over the works of the three artists chosen to exhibit here for the month of March. Among the many guests of the artists and organisers, I meet two young architecture interns from Rome and Portugal who saw the event advertised on Facebook. They’re enjoying absorbing the atmosphere and tell me they feel drawn in particular to the work of artist Bettina Egli Sennhauser. The artist herself tells me it’s the first time she’s ever exhibited. “We have a saying in Swiss” she says, “… which means like letting your pants down!” Everyone laughs but she adds “I feel like I am revealing myself … exhibiting like this takes courage”. A lawyer by training, she uses intuitive process painting which involves building up layers of marble pit lime similar to the way ancient frescos were established. The colour is then thrown on. Experimentation is also at the heart of Scottish artist Christopher Wishart’s work…or “a happy accident” as he calls it. 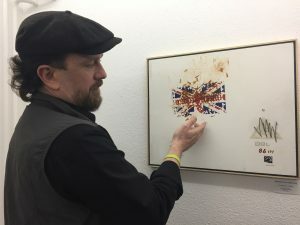 Miserable Prick, Faithful Dog seemed a fitting title he explains for his work which has a distressed Union Jack at its heart. It’s the first time in four years he’s exhibited. Austrian-born Artist Gudrun Sallaberger-Plakolb is also exhibiting her intricate pastel works. 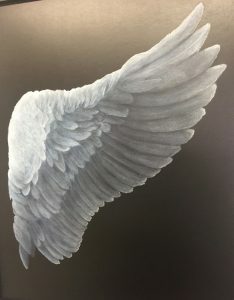 Her creations can be the result of an experience, an emotion or a photograph and she works continuously on each piece until it has the power to evoke an emotional response in its viewer. Depending on how the light falls on the finished canvas she explains, depends on which colours are revealed from the many layers of pastel beneath. Just a stone’s throw from the River Rhine and a leisurely stroll for the Art Basel crowds, the space will host further artists in April and again in May and June. Front of Bicycle continues to encourage artists from Basel and the surrounding areas to take advantage of this ever-growing platform to exhibit – so that they too might open a window into a whole new world of art lovers.